Indiana was chosen as the location for the new National Road Interpretive Center. The Center’s mission is to educate the public on the numerous implications and history of our nation’s first highway. Architura Corporation’s Principal, Michael Conly worked with the Historic Landmarks Foundation of Indiana’s owner representative, encompassing the interests of the Federal Government as well as the following states: Indiana, Illinois, Missouri, Maryland, Ohio, Pennsylvania, and West Virginia. The museum tells the story of the Historic National road from Baltimore to St. Louis. The project included campus site planning, museum connection to historic barn, orientation center, gallery, exhibit, interactive exhibits, café, gift shop, and support facilities. Weary travelers making the difficult trek westward on the National Road in the early 1800s stopped at the Huddleston family’s farm in Cambridge City for meals, provisions, shelter, and to feed and rest their horses. 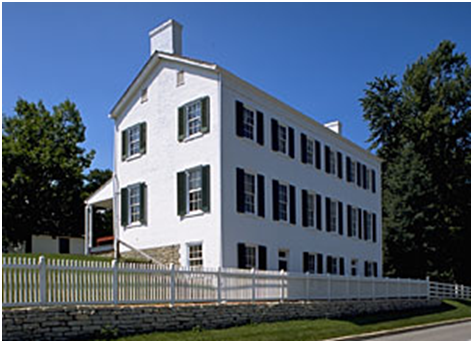 Owned and restored by Indiana Landmarks, the 1841 Huddleston Farmhouse museum offered visitors a glimpse of the daily lives of John and Susannah Huddleston and their 11 children, as well as the travelers who crowded the porches and yard and rented the farmhouse’s two “travelers’ kitchens” for cooking and sleeping. Today the museum operates as the National Road Heritage Site, where exhibits offer modern-day travelers a vivid picture of cross-country travel on the Historic National Road from Cumberland, Maryland to Vandalia, Illinois — from the pioneer era to the present.